Henry’s Hat in Studio City, just down the hill from Universal City, is premiering its “Halftime Hilarity” series on Monday, September 14—just in time for the first “Monday Night Football” show of the 2009-2010 NFL season—inviting notable comics to perform five- to six-minute sets during halftime of the evening’s featured game. Henry's Hat husband-and-wife owners A.J. Gilbert and Martha Madison also own Luna Park on La Brea. Following each Monday night game, the restaurant will offer a postgame “highlights” menu featuring some of Executive Chef Nick Cobarruvius’ signature items, as well as pitchers of select draft beers, all for half price. The “highlights” menu will rotate weekly and may include favorites such as the Aggies’ Chili Con Queso with Molten Cheese and Salsa ($4.25); the North Carolina-Style Pulled Pork Sandwich with Coleslaw and Chipotle BBQ ($4.50); and the Banana Split with Chocolate, Vanilla, and Strawberry Ice Cream and housemade Fudge and Strawberry Sauce ($3.50). The first “Halftime Hilarity” show begins at halftime of the 7:15 p.m. (PT) game on Monday, September 14. Moving forward, “Halftime Hilarity” will take place during halftime of the 5:30 p.m. (PT) game every Monday. The brainchild of husband-and-wife owners A.J. Gilbert and Martha Madison and Henry’s Hat bartender Minnie Goode, who also moonlights as a standup comedian herself, this lively halftime show is intended to bring a unique twist to the typical sports-watching experience. “Henry’s Hat is an ideal spot to do something like this. The atmosphere’s laidback and friendly—all around it just seemed like a natural fit,” says Goode, whose comic and professional résumé includes performances at Hollywood’s Comedy Store, The Improv, and The Laugh Factory, as well as television appearances on MTV’s “Punk’d” with Ashton Kutcher. Comedians scheduled to take the stage at Henry’s Hat, in addition to Goode, include Marianne Sierk (winner of the LA Improv Comedy Club Contest), Michael Goldstrom (featured on Comedy Central, HBO, and NBC, among others), Mark Daviau (deemed “one to watch” by Paul Provenza, director of the cult comedy documentary “The Aristocrats”) and Angie Greenup (a series regular on the new CBS show “Smash Cuts”). Rounding out this cast of characters is a selection of secret guests, each of whom has committed to make a surprise appearance during the season. 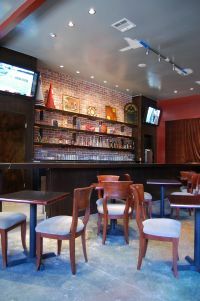 Comedy acts will be performed in the “Den,” a separate room adjacent to the main bar where the games are shown on the 5-by-5-foot projection screen. Want to know more about what Henry’s Hat has to offer? Read the My Daily Find review here. Henry’s Hat is open Monday through Thursday 11:30 a.m.-11 p.m., Friday 11:30-12 a.m., and Saturday and Sunday 9 a.m.-10 p.m. (open early during the football season to accommodate East Coast air times), offering weekend brunch, and lunch and dinner daily. 3413 Cahuenga Blvd. West, (between Barham and Lankershim Blvds.,) Studio City (323) 512-2500. Visit www.henrys-hat.com for additional information.